First post! Some of you might know me from PixelJoint. I don't post a lot of art, mostly for one reason: I never finish anything. I have a lot of trouble polishing/refining things, they just get stuck in a perpetual rough state, no matter how much work I put into trying to clean them up. They never look finished, so I never post them. I'd like to learn to put a spit-polish on my stuff. I think I just have no sense of direction/goal once the general forms are there. 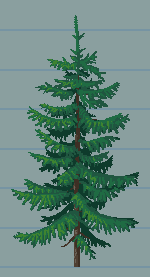 I have a similar issue with non-pixel art, but I've developed some techniques to deal with that, which sadly don't apply to PA. 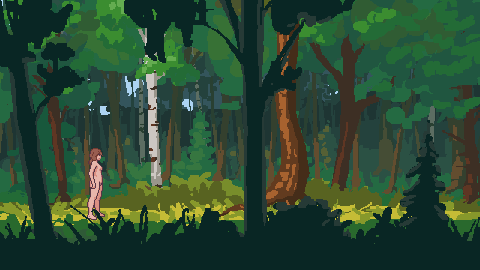 I feel satisfied enough with the general shape of it and I'll be tweaking the colours once I have more of the assets done so that I can make sure everything works together, so my goal here is mostly pixel-level polish. Edit: Tweaked it a little, still doesn't look done. Need to make nicer clusters, but I am clueless.